As you might have gathered from my previous posting about Adventure Games, I’ve spent a lot of time recently playing these games and while there are many different details that I loved in different games, there was one game that stood out because every aspect of it was perfect: Indiana Jones and the Fate of Atlantis. I believe that this game should be taught in game development classes, but as a substitute I’m creating a little series where I dissect the various parts of the game. Let’s start at the beginning, at the intro. Intros and Prologue sequences have two jobs: They need to establish the scenery/mood and ease the player into the game. If Intros are too long (like many of the “cinematic” games these days), you risk losing the players attention span. If you just drop the player into the action, you put a lot of stress on them from the beginning. Experienced Gamers may feel annoyed by too much handholding and even inexperienced gamers may feel overwhelmed or even insulted by tutorial prompts if that’s how you want to introduce the game mechanics. Atlantis does something I never saw before it, and it makes the intro perfect: It puts gameplay into the actual intro/credits sequence. As intuitive as point and click adventures are, there is still a lot of stuff going on on the screen with the verbs and inventory. There is no stress and no long delay before you can actually play the game. Indy swings in through the window, which establishes him as some sort of action hero to people who don’t know him. 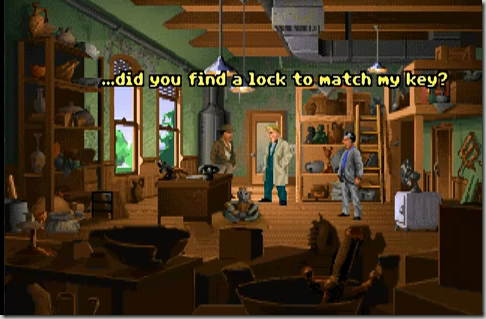 The dialogue lets the player know that Indy is searching for a STATUE in all this JUNK. The emphasis is key here. 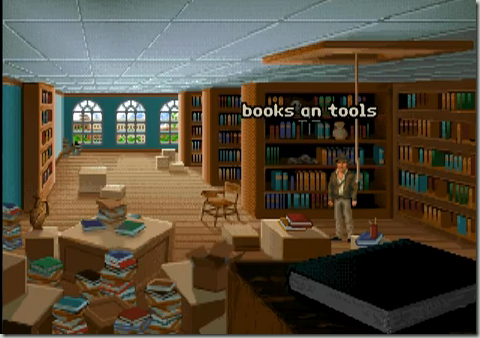 It encourages the player to look for a statue, and it’s clear that junk refers to the stuff in the room. 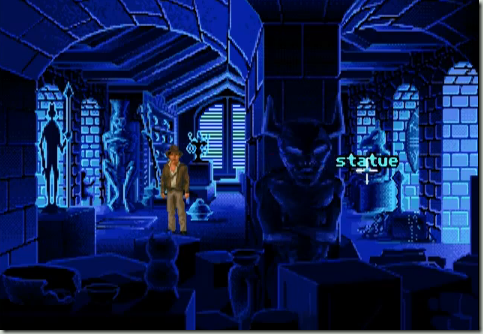 Now, Indy is referring to a small statue at the end of the intro sequence, but we don’t know that yet. All that we know is that we’re looking for a statue, no idea how big or small or any other details. At this point, there are exactly two things of interest: The scenery and the mouse pointer. No verbs, no inventory, no other characters, no sideways scrolling, no time limit, no stress. As the player is moving the mouse around, text on the screen indicates what everything is. Clicking on anything will have Indy interact with it. Eventually, the player will click on the big statue (with the big trapdoor in front of it) which sends Indy down a level. More credits, more exploration. Except that there is no statue here. Exploring will yield no results. 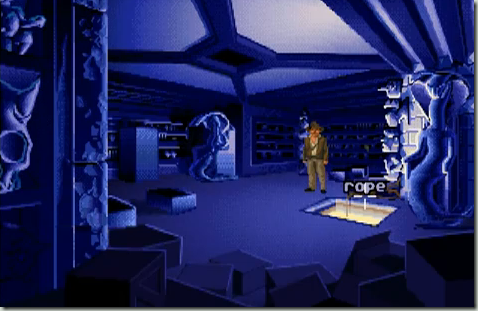 But there is a very obvious hole in the floor (unlike the trapdoor before, which was covered) with a rope, so the player is pushed to think “There is nothing here, let’s keep exploring”, and the rope makes it very obvious that going down the whole is the desired option. This one appears a lot more crowded than the first two. There aren’t any more items here, but there is a bigger emphasis on differentiating between seemingly similar items. The three bookcases on the right all have different titles even though they look the same. There is an exit in the back, invisible if not by hovering over it (which should naturally happen when trying to discover what the book shelves are and introduces the concept of hidden hotspots) and blocked (because the staircase is currently being repaired). The sole bookcase on the left contains books about statues. I’m not sure if this qualifies as an abstraction (We’re looking for a statue => maybe a book about statues would help? ), but it fits the room. Interacting with the bookshelf sends the player down again. There is one exit, obviously visible but not usable. 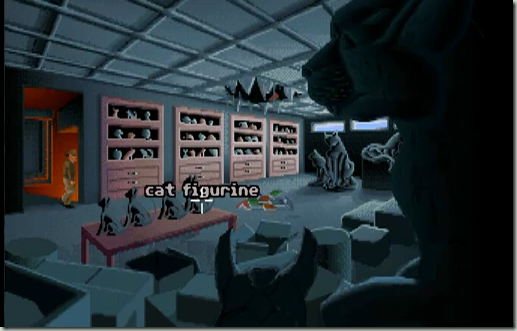 There are 4 cat statues, and nothing else that can be interacted with. Interacting with any statue gives some flavor text, but nothing else. Only when we interact with statues again, one of them turns out to be a real cat, sending Indy down the coal chute. This introduces the concept of multiple interactions with an object. Both exits are blocked: Indy can’t go up the coal chute because it’s too slippery and he refuses to leave through the door without the statue. The new concept introduced in this room is the locker door. Clicking any of the three lockers opens it, and the third locker contains the desired statue. In real life, opening and closing doors seems obvious, but computer games have limitations and the previous screens had objects that couldn’t be interacted with. The lockers emphasize again that you can interact with objects and that some objects have some sort of state, in this case open/closed. 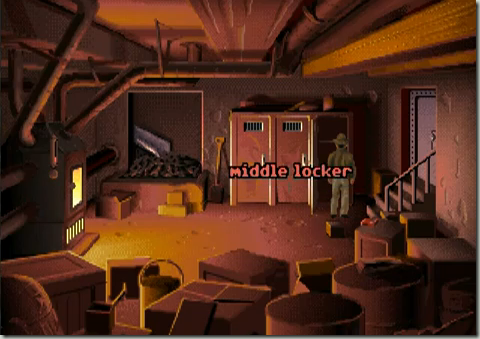 When you open the third locker, two things happen: First, Indy clearly exclaims that this is what he was looking for, and second the statue is highlighted, inviting the player to move their mouse here. The emphasis here is not just to guide the player, but also to let them know that changing the state of an object (opening the locker) can lead to new interactions that weren’t there before. 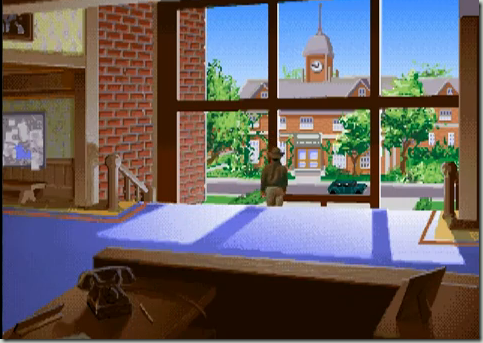 In theory, Indy could just appear in his office, but instead we see him walk from the storage building towards the administrative building. I am not sure if this was just done to squeeze in more credits and showcase the graphics, but I see another real use here: It familiarizes the player with the location. Later, we need to come back here and go back all the way to the first screen. By having this intermission screen, the game does not need to tell the player later on where the storage room is. This is the first time we see other characters, and another important element is introduced here: Every character has their own text color. In the modern age of fully voiced games this may not seem significant, but when Atlantis was first released, there was no speech. By assigning text colors here, we know who is speaking in scenes where the characters aren’t visible, which conveniently happens twice in this scene. Apart from that, this is the first real non-interactive part of the game, going on for about 3 minutes. At this point the player is (hopefully) already hooked, so they won’t be impatient as they sit through this. It also sets in motions the events of the game and the reason for this whole trip and establishes the time line for people who don’t know Indiana Jones. 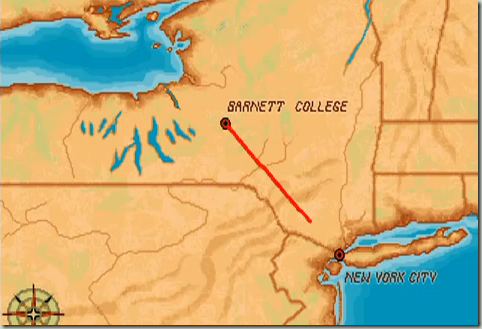 Indy has to travel a bit during the game, and this non-interactive screen simply establishes his current location (Barnett College, which was not stated so far in the game) and signals that you can travel to locations with a red dot. This is where the game begins for real, but it doesn’t just begin. When the screen fades in, we have the scenery on top, which is a familiar interface by now. Below, we have the word “Walk” and nothing else. Only after a few seconds, the verbs and inventory bar fades in. I do not know if there is a technical reason to have the word “Walk” visible before the action bar, but to me it seems that they wanted to introduce this new element to the player before they show the action bar (which doesn’t contain the word “Walk”). New Players might now experiment again, noticing that they can interact with the world in a more diverse way. This screen also uses horizontal scrolling for the first time in the game and has player initiated dialogue. 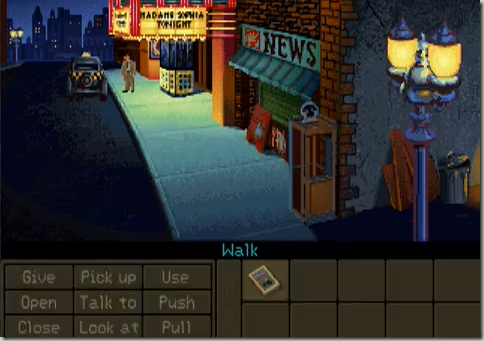 The introductory sequence manages to have a long introduction of the settings, the characters and the antagonist without having the player sit through a long non-interactive sequence. It introduces Indy as an action hero and only brings in (light) puzzle solving at the very end. It creates a landmark that the player can recall later on. Every single thing in the intro seems to have been done for a reason and by the time you’re in New York you’re past the initial bump of getting used to a new game.